“Home Run Juan, Home Run!” a lady was yelling who was sitting down from us. Phillip just finished explaining that she was the “resident” screamer; also, the most likely candidate who would sleep with all the players given the opportunity. He went on to explain when she yells, the players strike out 8 out of 10 times. He said, “Wait, it will get worse when she has a few drinks”. Juan Duran of the Pensacola Blue Wahoos promptly struck out. I asked about the lady who sat by the visitors dugout. Phillip said her family shows up at all the Pensacola sporting events and ,mentioned, she never agrees with the umpires calls. I noticed her for that exact thing. She was berating the second base ump on a call that I thought he got right, but my glasses might have deceived me. She seemed mean to me. Gamesmanship is one thing, but I could picture this lady punching the umpire if she were to run into him at a bar. She took that call personally! 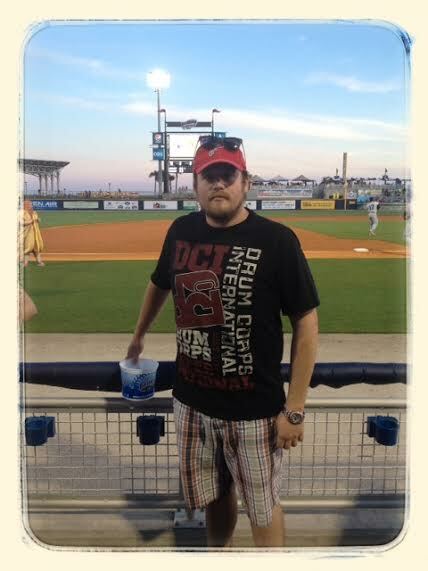 Phillip (with two L’s) Michanowicz has been a season ticket holder to the Blue Wahoos the last three years. He gets to 80-90 percent of the games. Since they play 80 home games that is a lot during the summer time. He attributes some of the enjoyment to the fact that it is a new ball park. The city of Pensacola built it right down on the water over three years ago, in hopes of attracting a team and revitalizing the area. I thought the place was great. You can see the ocean over the outfield walls, the site lines were tremendous, and the overall stadium structure was unique. The stadium had a real “beachy” feel to it – watch a ballgame or grab a surf board. Phillip said he was more into music growing up, he didn’t play baseball but he always watched because his brother, Cameron, played in the minors leagues for the Reds, Phillies, and Pirates. I asked what it was like to watch one team, day in and day out. He told me it was about the spirit of the game and how each individual player treats it, besides the staff that works the Blue WaHoo games are great, “They might not be the best team in the world, but I enjoy coming”. He says he can tell if a player is really into playing, when they aren’t and how that affects the flow of the team and the game. Phillip relates this type of mentality to the DCI (Drums Corps International) teams he was apart of for three years. From about Memorial Day until the middle of August he worked with a team of 150 members that made it through the try-outs. Each were selected for this highly competitive (think) Marching Band (on steroids). They were together seven days a week practicing and performing their routine that took 11.5 mins. The “team” traveled all over the country. The days were long, normally 16 hours and they slept in high school gyms or college dorms. They were a team through and through with all the personalities that went with it. The largest crowd he preformed in front of was over 100,000 people at the Rose Bowl on July 4th, 2010. His team beat out the other 25 nationally competitive teams to win the World Championship that year. I was intrigued by this sport that I knew nothing about, yeah I called it a sport, I want everyone to go and try and play an instrument will marching, running, and dancing! Anyway, I could spend another 500 words on this but I can’t, check it out – The Marching Band. Phillip related a great baseball story to me about former Dodger manager Tommy Lasorda. His grandpa knew Tommy and they used to compete against one another playing high school baseball. About eight years ago during Spring Training, Phillip’s brother, Cameron, saw Tommy walking across the field and called him a nickname from high school. As the story goes Tommy’s head snapped up and he looked at Cameron, walked over and asked, “How the hell did you know that name?” Cameron explained to him about his Grandpa. Tommy remembered him and had a good laugh then went on his way. So next time you see Tommy, call him “Hondo”, you might get a reaction. I noticed that everyone had baseball gloves in the section we were sitting in, even the older people. I assumed everyone loves getting balls as much as I do! Wrong!! Phillip explained to me that it is for protection more than anything else. He said he has seen a lot of people get nailed with a ball. “Not pretty”, he added. Later in the game, after Phillip left, an older lady got nailed, it looked like it hurt. On average Phillip said he gets about 20 foul balls a year, he gives some to his nephew or he will get autographs of some the better players. Phillip did get to see Yasiel Puig play here last year for the Chattanooga Lookouts at the beginning of June. He wondered why he wasn’t playing for the Dodgers at that time, since he was awed by his talent. Sure enough the next day he was called up to the “Bigs” skipping Triple A ball in the process. Two years ago on August 21, 2012, he got to see Billy Hamilton steal his record 145th and 146th base in his 120th minor league game. I enjoyed talking to Phillip, he left after the seventh inning. He didn’t miss much except the “Screamer” screaming. It was obvious, she was feeling no pain. The Blue Wahoos got beat by the Lookouts 6-0. I need to give a shout out to Razors Edge CrossFit in Pensacola for letting me workout with them yesterday and also for the shirt, I will wear it proudly! Also a sincere thanks to my friend from high school Bob Hanson and his beautiful family – Julieta, Neil, Valeria, and Sophia. They invited me to stay with them the last two nights. I got to have coffee with Bob five weeks ago the first time I passed through Pensacola and was grateful to see him again this time. Thank you again for your service! Right away this article made me think of Mary Louko and her wonderful screams at every ball game or hockey event. Great story! I found myself nodding in agreement throughout. We all know who the resident screamers are!